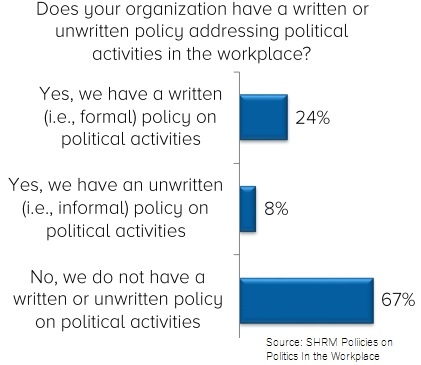 More than a quarter of HR professionals are already reporting an increase in workplace political volatility compared to previous election seasons, according to a recent Society for Human Resource Management poll. The same study found only 24% of organizations have written policies on how to handle political activities, though 72% say they discourage it. When work and politics mix, the risks are widespread. Employees may not feel safe or respected. Recruiting, retention and productivity can be impacted, as can brand loyalty and customer retention. Even CEOs can be at risk: Remember how Mozilla’s CEO got ousted for donating money to legislation aimed at repealing gay marriage? The CEO’s values clashed with those of many of his employees and organizational stakeholders. Tthe repercussions were immediate and severe. 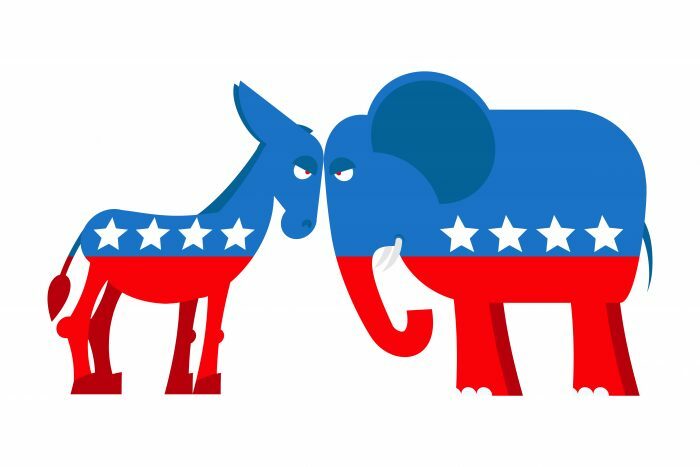 Given the frequent spill-over between the personal and professional realms when employees socialize with each other in person or via social networks, it’s inevitable that some political discussion will extend to work. Remember that employees often take their cues from their leaders, so set the example you’d like others to follow. If you pontificate about the election or hot-button issues, don’t be surprised if your employees follow suit. If you largely leave politics out of the workplace, your team will be more likely to follow your lead. Your workplace must balance freedom of speech with freedom from harassment. It’s illegal to ban political discourse outright, but specific laws and best practices can vary by state and industry. Now is a good time to check with your compliance officer, legal counsel or other advisors to make sure you and the management team know the law. Now is an excellent time to review your company mission statement and vision. What are you trying to accomplish, who are you trying to serve, and what are the values that align with that vision? Extending this exercise further, how should those values apply to political expression within your workplace? Look both internally at corporate culture as well as externally at your corporate brand and employment brand. What values, including political values, are consistent and inconsistent with your corporate culture? Be aspirational but also realistic and consider both short- and long-term risk factors as part of this exercise. Once you’ve reviewed company culture, including the extension of that culture to political considerations, translate the vision and values into clear workplace practices. Determine specific office policies and get specific in order to reduce ambiguity. For example, can employees wear candidate or issues-specific clothing, stickers and gear to the office? Can they don them on their laptops or backpacks? What is the policy regarding political references in group emails, online chats and desktop backdrops? Review everything discussed thus far, from core corporate values and vision to the specific policies you’re rolling out. Distinguish healthy debate from hurtful argument. Remind people never to assume anyone’s political views and to back off of controversial conversation topics if someone looks uncomfortable. Reinforce the importance of diversity of all types, including diversity of thought, to the workplace. And make sure that you and the entire management team are consistent in your application and enforcement of these policies. Also make sure that situations that do arise are diffused quickly before they escalate out of control. We still have many months to go before election day. It’s only reasonable to assume that between now and then election-related workplace skirmishes will transpire. The question is: Will you be ready? Mathilde Pribula is a partner at the leading HR executive search firm Frederickson Pribula Li. Over two decades, FPL partners have built the HR leadership teams for the world’s most transformational companies. Serving high-growth start-ups, unicorns, and the Fortune 100, Frederickson Pribula Li is deeply rooted in Silicon Valley and maintains a presence in all major tech hubs. Clients include Facebook, Uber, Pinterest, Microsoft, Twitter, Genentech and other major technology, media and biotechnology leaders and rising stars. Pribula leads the search practice at FPL. She earned a Master's degree in International Employee Relations and HR Management from the London School of Economics and a business degree from ESADE in Barcelona. A native French speaker, she is also fluent in Spanish and English.